Lowest prices all the time, guaranteed! If you find a better price, let us know. 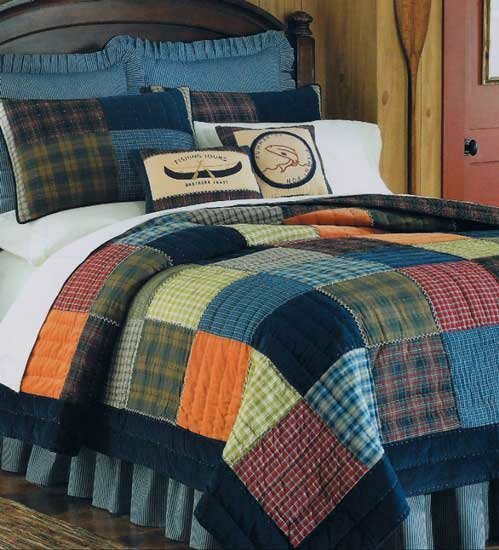 Northern Plaid quilt bedding by C & F Enterprises is a classic block quilt pattern. Various plaids in blues, reds and greens are accented with solid orange and navy. The bedskirt and euro shams are offered in a wonderful blue and navy stripe. 100% cotton, machine wash and dry on gentle. Plaid patchwork squares with a navy border. Luxury Oversized. 66" x 86". We offer the complete ensemble in the Northern Plaid pattern by C & F.
Plaid patchwork squares with a navy border. Luxury Oversized. 90" x 90". Fits full and queen size mattresses. We offer the complete ensemble in the Northern Plaid pattern by C & F.
Plaid patchwork squares with a navy border. Luxury Oversized. 108" x 90". We offer the complete ensemble in the Northern Plaid pattern by C & F.
39" x 76" gathered 14" drop bedskirt in blue stripe. 100% cotton. By C & F Enterprises. Allow approx. 3 weeks delivery on this item. Tan pillow with brown button accent. Feather down filled. 18" x 18".